We've been a little down on Home from time to time. Frankly, because most of the time, it deserves it. But today, as mentioned, sees the release of something that gives the service a purpose. It's the Warhawk Command Centre, a feature I long dreamed about for in Wing Commander and X-Wing but which is only now managing to make its way into being. Basically, it does as says: it's a command centre. 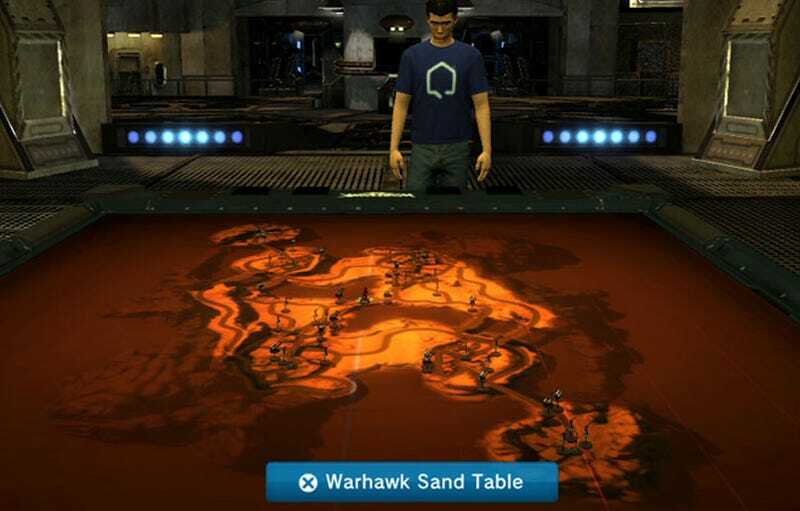 Players can enter a room, hang out and, most importantly, talk tactics and discuss strategies on an interactive sandtable map. Sounds simple, but it's that little extra something that transforms Home from an idle curiosity into something genuinely useful to a gamer. Hopefully other developers take heed and release similar spaces (yes, Killzone, we're looking at you). Oh, and to celebrate the opening today of the space, Warhawk is $10 cheaper at $20. All kinds of good news here. To get a more in-depth look at the Warhawk Command Centre, check out the vid below.